The Vermont chapter of the American Public Health Association, the VtPHA, released a list of policy proposals Wednesday, that officials say will help curb negative effects of using pot and steer the legislative debate toward health concerns. VtPHA recommends that the state restrict marijuana use in public places; set standards for licensed retailers; place clear limits on intoxication levels for drugged driving; and hire sufficient personnel to adequately regulate the cultivation, distribution and sale of marijuana. Several of the VtPHA’s proposals mirror recently released Vermont Department of Health recommendations, including a prohibition on pro-pot advertisements, an age limit for buying marijuana and use of tax revenue for health programs designed to curb use and learn about effects of the drug. The association joins a growing group of key leaders and interest groups that either support legalization or simply expect legislation to pass. Both Vermont Attorney General Bill Sorrell and officials at the Vermont Department of Health have said they are preparing for the legal and public health implications of the bill’s passage. “The association is operating under the assumption marijuana will be legalized,” said Burt Wilke, a spokesman for the VtPHA. Gov. Peter Shumlin has long been a supporter of legalization. Leaders of both the Senate and House, shifting from previous positions, have indicated they won’t impede a legalization bill. The VtPHA released policy recommendations, Wilke said, because they worry policymakers are too focused on revenue from marijuana legalization. Last year, a state-authorized RAND Corporation study found that the state could generate up to $75 million in tax revenue from a regulated pot market. A majority of Vermonters, 54 percent, support legalization, according to a Castleton Polling Institute/VTDigger poll released last year. 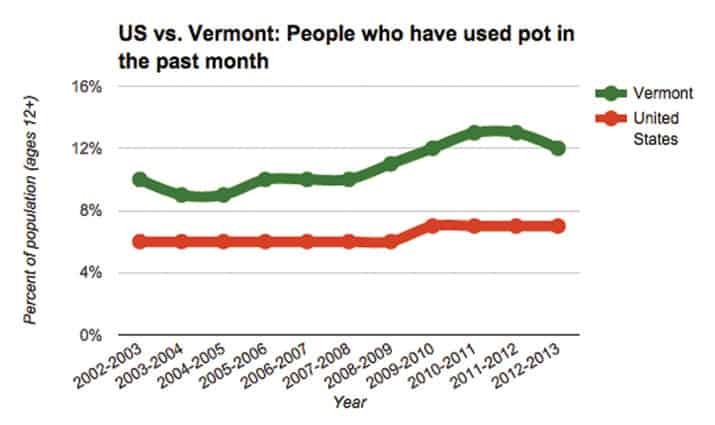 Pot use in Vermont has been higher than the national average for the past decade. In 2013, 12 percent of Vermonters said they used pot in the past month, compared with just 7 percent nationally according to the National Survey on Drug Use and Health. Researchers looking to study the health effects of marijuana have long run into red tape. Marijuana is a Schedule I drug, and researchers have to go through the arduous process of buying research-grade marijuana from the federal government and then applying for a DEA license to possess and move the drug. In 2008, the American College of Physicians — a group that represents more than 140,000 medical professionals — came out in support of measures to ease restrictions on marijuana research.